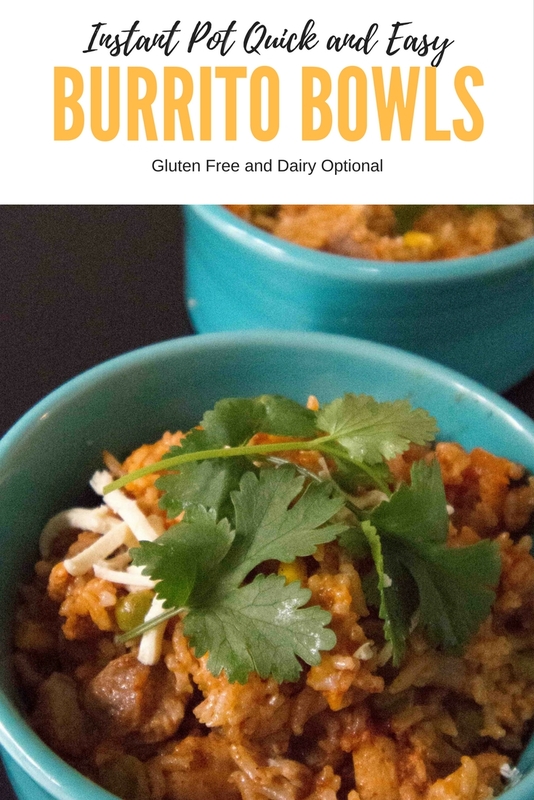 Easy and Fast InstaPot Chicken Burrito Bowls Gluten Free and Dairy Optional Instant Pot Burrito Bowls Fast and Easy. Aggregate rating will show here Serves 3-4 Ingredients: Brown Rice, Chicken, Tomato Paste, Chicken Broth, Chili Powder, Chipotle Pepper, Salt, Pepper, Frozen veggie mix, add as many ingredient tags as you need. Instructions: Click through for full instructions. 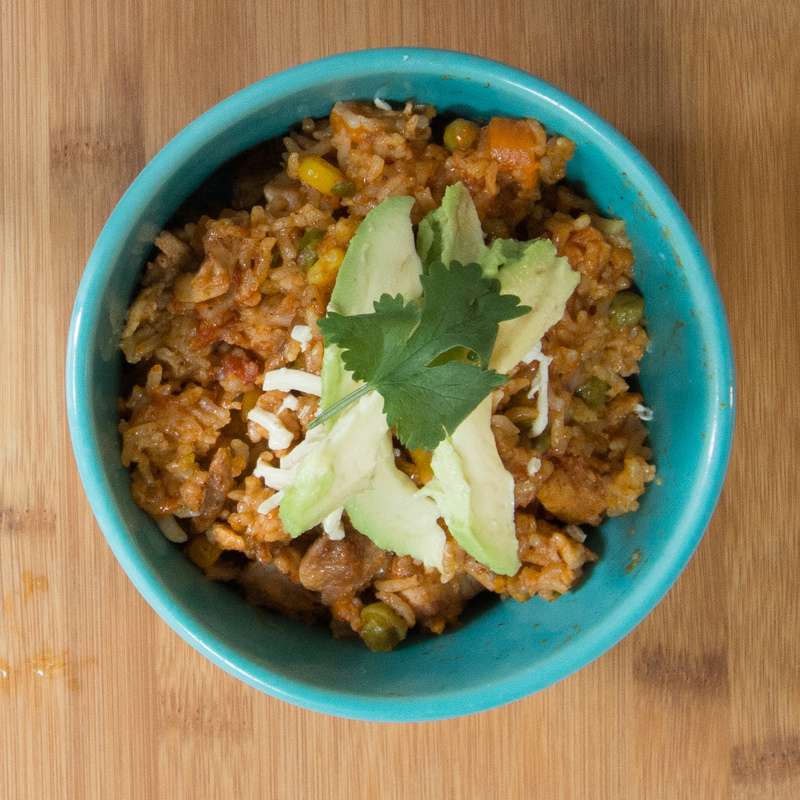 This burrito bowl recipe is insanely easy and a great dinner or awesome lunch. I have been making it and saving some for lunch the next day. It reheats well as long as you leave all the toppings on the side. I found that brown rice holds up a little better in the Instant Pot and also is a more healthy option. So as much as I love my white rice carbs, for this one I went with brown rice. I also feel like a little more time cooking helps that flavor. White rice tends to over cook and get mushy. The best thing about being able to use the Instant Pot is how much it cuts back on the mess. All you need is a cutting board and knife and the Instant Pot. Everything goes in together and gets cooked awesomely. The toppings are optional. I used Daiya cheese mozzarella shreds, avocado, and cilantro. They all work with the Mexican flavors well. I put real cheese on my husband and child’s dishes since they can have dairy. Also optional is more salsa and tortillas. We ran out of tortillas the other day and I ate it with blue corn chips which was amazing! So this dish has a lot of ways it can be eaten deliciously! If you are looking for a salsa recipe to top it with you can check out my Chipotle Salsa or Salsa Verde by clicking on the links. I hope this makes your life just a little bit easier. I am excited to get into more uses for my Instant Pot. It is really an amazing new tool and one of my favorite Christmas presents. If you want one yourself you can check them out here on amazon.com. optional toppings: cilantro, Daiya cheese, avocado, tortillas, corn chips, salsa and anything else you can think of. Measure and add chicken, veggies, chipotle chili, tomato puree, and chili powder. Set Instant Pot to Steam for 25 minutes. When it is done, slow release the pressure. Spoon into bowls and top with your choice or optional toppings.